Why I picked it up: Young adults are not monolithic. They present a variety of attitudes and behaviors. They are also more ethnically and racially diverse than older generations … a forerunner of the dramatic demographic change taking place (and leading to likely minority majority status by 2045). As museums strive to be more inclusive, and since young adults are more likely to visit museums than older adults, it pays to know this audience's attitudes on race. Young adults of color are significantly more likely than whites to think racism is a significant problem today. A majority of white Millennials see Confederate symbols through the lens of Southern pride, and nearly two-thirds oppose removing Confederate statues and symbols. Unsurprisingly, the majority of young adults of color feel rather differently. Millennial Trump voters are significantly more likely to feel that whites are economically losing ground compared to other racial and ethnic groups, including in the workplace and in college admissions. White Millennials were significantly less likely to include race/ethnicity as a major identifier of themselves than people of color (the overwhelming majority of whom listed it as their #1 identifier, over gender, economic class, etc.). This reminds me once again that only whites have the luxury of forgetting about the color of their skin in our American society. I recently shared that research from the Robert Wood Johnson Foundation found 55% of white Americans thought whites experience discrimination. GenForward asked a similar question, and found 48% of white Millennials think discrimination against whites is as big a problem as discrimination against people of color. Yep. Half of white Millennials think they are just as discriminated against as people of color. That is only seven percentage points lower than the American topline results, so while it is better than what older Americans think, it isn't a huge shift. There are, however, some more positive signs. Awareness of racial challenges and disparities appear to have increased among whites between July 2017 and September 2017 (a two-month period that included Charlottesville and other racial demonstrations). It is unclear, however, if that is a blip or sustained. Additionally, the survey asked respondents what they thought the best way to make racial progress was. About a fifth of respondents said "organizing in communities," a number that was fairly consistent across race and ethnicity. Whites were similarly likely to say "community service and volunteering." Voting and non-violent protests also came up as good pathways. Implications for museums: Like I shared when reviewing "Discrimination in America," many whites are not as open to conversations and actions that promote inclusion and equity as we would hope. Thus, museums promoting a more inclusive interpretation should do so with awareness and preparation for white pushback … even among younger visitors. This is work that we must do, and anticipating that pushback strengthens our work, allowing us to push forward steadily. Because that's the goal: ongoing progress, not reactive pushes forwards and then similar retreats. Methodology comment: It is clear that the designers of the agenda had a hypothesis they wanted to test, and the survey instrument reflects that agenda, which is an anti-racism, progressive one (it included rather specific questions about Donald Trump and his purported racism, for example). This doesn't make the research bad, so long as the questions are presented neutrally and the results fairly. But it also makes this work easier to criticize if one were of the opinion, say, that whites face just as much (if not more) discrimination than people of color. Thus, when critiquing research, including studies you like or even my studies, instrument design is something to be mindful of and assess as necessary. Read or skip? If you are deep in the weeds of inclusive practice, yes, read it. This will give you more nuance. If you have to pick one to read, I'd go for "Discrimination in America." This supplements that work nicely. And if you have a Confederate symbol controversy raging or brewing in your community, the questions on those very things will undoubtedly be helpful (go to pages 20-22). Full citation: "The 'Woke' Generation? Millennial Attitudes on Race in the US." genFORWARD. October 2017. Why I picked it up: Hispanics and Latinos are the second-fastest growing minority group in America (after Asian Americans), and the largest, and youngest, minority group. If museums are going to thrive in the future, they have to adapt to meet the needs of a broader swath of Americans; Hispanics and Latinos have historically been underserved by museums. 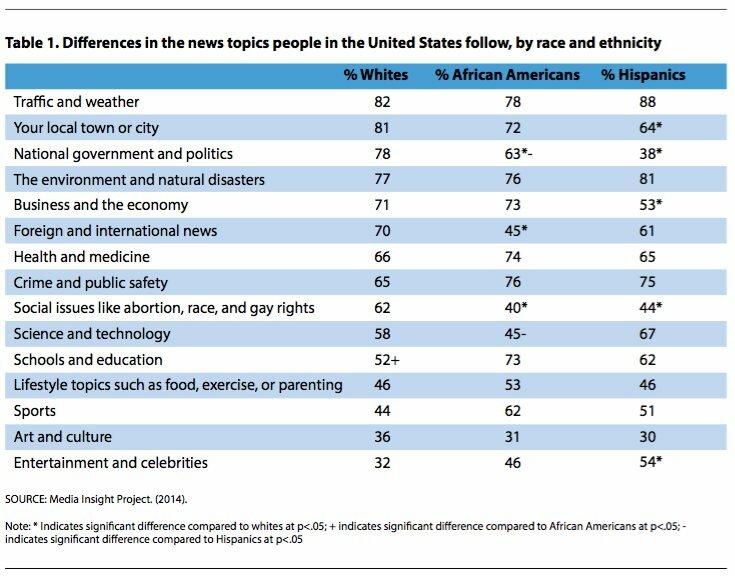 1 - That whites are far more interested in local town or city news than African Americans or Hispanics. It makes me wonder if there are barriers to connecting with a local community that African Americans and Hispanics are more likely to feel. And if so, what can we do about it? Lots of questions here. 2 - That Hispanics are more interested in science and technology than whites, with African Americans significantly less interested. That seems like a great opportunity for museums to tap into (as well as work to be done). Hammers home that the Hispanic and Latino audience is not monolithic, and that individuals are more likely to identify by their nationality (i.e., "Honduran" or "Guatamalan") than "Hispanic" or "Latino." Emphasis on taking the time to get to know who your audience actually is, and to reflect their linguistic and symbolic preferences in your communications. Service providers to Hispanics and Latinos emphasize how important face-to-face communications are, such as knocking on doors, going to events, visiting schools, and partnering with educational, faith, or medical groups. While more labor intensive, it is far more effective than broader media outreach. Note: this communications guide focused on lower socio-economic Hispanic and Latino households. Implications for museums: Museums generally struggle to reach Hispanic and Latino households, just as they do households that are of lower socio-economic status (SES). To hear that public assistance programs, and the nonprofits that work with public assistance, struggle as well doesn't absolve museums from the struggle, but puts it into context. If you are serious about reaching Hispanic and Latino households, it takes grassroots work to do it effectively. Face-to-face communications and hard work to build trust and connection. It is a long-term, incremental process. But as our population changes, it is one that is necessary if museums are truly going to matter in their communities. Read or skip? Skip. The bulk of the report was a toolkit for communications, and was well done; if you are new to communications work you should check it out. But there were few insights that were truly about Hispanics specifically; most applied to low SES households in general, not just Hispanic ones. I had high hopes, but it just wasn't the report I hoped it would be. The most relevant bits are highlighted in this review. Final thoughts: The report mentioned repeatedly that we should listen to our audience and identify them by how they identify themselves. Yet the report pretty much used "Hispanic" and "Latino" interchangeably (as others, such as Pew, do). They are not, however, the same. "Hispanic" means Spanish-speaking origin, so it would include individuals from most of Latin America and Spain … but not Brazil, as they speak Portuguese. "Latino" refers to individuals from Latin America, including Brazil, but not individuals from Spain. Full citation: "Researching and Engaging with Hispanic Communities." Research report published by Child Trends Hispanic Institute and The Crimsonbridge Foundation. Released September 28, 2016.